On this voluntary teaching placement you will work with a community literacy project. You will help teach Jamaican adults to read and write. Approximately 21% of adults in Jamaica are illiterate. This project teaches adults in small groups where they feel comfortable. Your knowledge and experience as a teacher will assist in this innovative projects development. How can volunteer teachers help in Jamaica? Working with existing staff to help improve their teaching methods. Working with a class of adults to improve their basic literacy skills. Providing advice on issues such as career choice, work etiquette and opportunities for further education. Teaching individual pupils in their own home. 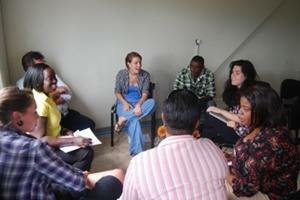 Organising and running training clinics for Projects Abroad volunteers working with local schools (optional). Most of your classes will involve groups of around 10-15 adults. Classes are organised in local communities to make them more accessible. A curriculum is provided and you will be expected to set homework and assess your pupils’ performance. You will gain experience in a new way of teaching adults. You will be able to get out of the classroom and teach outdoors or in people’s homes. You will also interact with fellow teachers and learn from each other’s experiences. You will also benefit from the ‘feel good factor’ that comes from improving people’s lives. 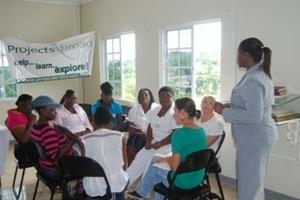 Through educating adults in their own homes and communities you will learn about Jamaican culture and way of life. Staff and pupils will want to hear about your life back home and your family and friends. We call this ‘cultural exchange’ and we think it helps our volunteers gain a new perspective on life. Safe accommodation with an Jamaican family close to your project. If you are interested in this project but don’t have the relevant experience, then please read about our regular Teaching projects in Jamaica.